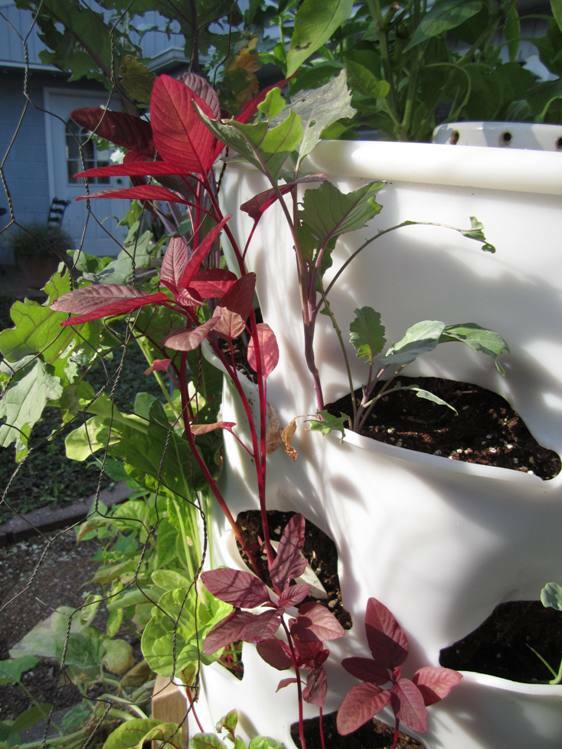 Time for an update on our vertical gardening project. When last I posted about the Garden Tower, everything was growing robustly and looking smart. I hate to say it, but that was kind of the high point of the season. The plants have not grown as vigorously as I’d hoped since that photo session. Our Garden Tower in mid-September: Not bad but not great. And this is its good side. Today there are five tomatoes just about ready to pick, but the plant looks pitiful. I cut off most of the grim stuff a few weeks ago. Not sure what kind of maters these are; the plant was a sucker from a friend’s tomato patch, and she didn’t label it. On the bright side, we’ve had several cucumbers, as well as snippings of basil, parsley, and kale. 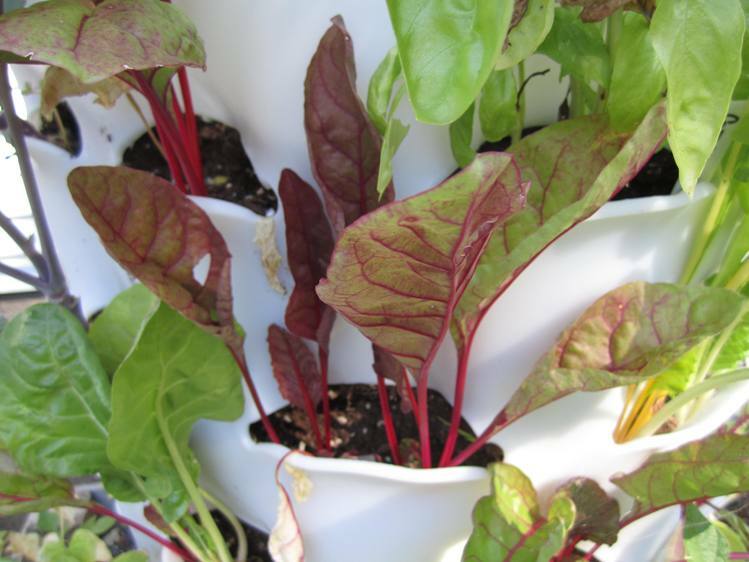 I’ve also harvested a few small beets from the top (with lovely greens)—and more are still growing. I planted immediately after filling the barrel with the soil mixture. When I watered everything in, the soil sank a couple inches. This caused the plantings in the side holes to become quite leggy as they reached for sunlight. In retrospect, I probably should have watered well first, allowed everything to settle, and then planted. That might have given them a better start. I overcrowded the side pockets, planting more than one seed. I told myself I would remove all but the strongest seedling later, and I did some thinning, but not nearly enough. I just didn’t have the heart to do it. I bet they would have grown bigger with less competition. One point of pride: my daily hand picking of cabbage worms at the height of their infestation seems to have saved my kale plants. However, it was too late for the kohlrabi and cabbages, which have not progressed beyond seedling size. I’m told that an application of Bt and some ladybugs would eliminate these little munchers, so we’ll keep that in mind for next year. It may have been another misstep to mix our compost into the potting soil, given how much trouble we’ve had with diseases in our tomato plants. I hated to see the tomato transplant succumb to the same yellowing and crispy leaves we’ve had the last several years in our regular beds. But: no blossom end rot; the tomatoes themselves are so far looking luscious. We can’t do anything about the soil, short of dumping it out and starting over, and I’m not willing to do that. But the other issues are all learning points for the next growing season. With gardeners, it’s all about next year! 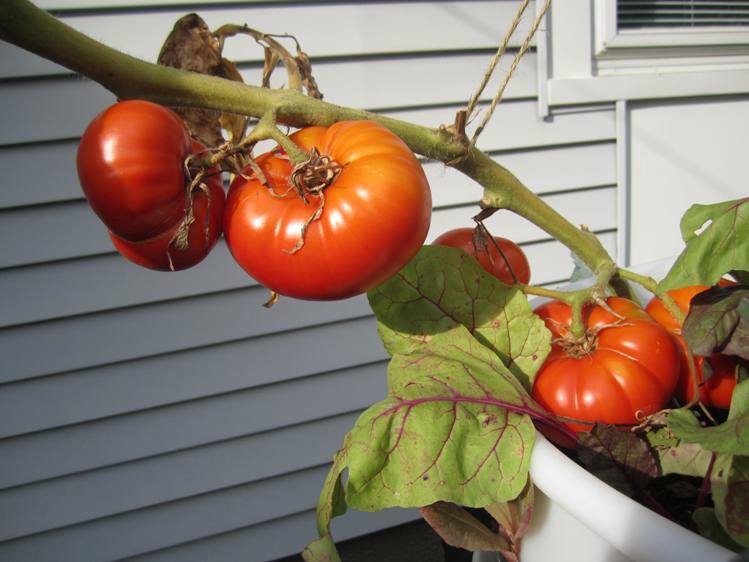 This entry was posted in Homesteading and tagged Compost, Garden, Garden Tower, Local food, Plant, resilience, Sustainability, Tomato, Vertical Gardening, worm composting. Bookmark the permalink. 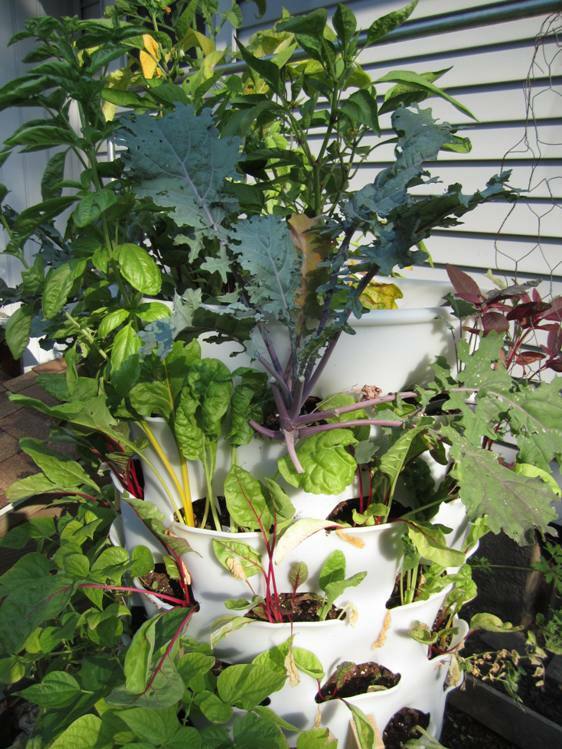 Too many plants share the growing soil (rooting space) making the nutrients in the soil can not support all plants. Clearly I need to be more ruthless in my thinning! Thanks SO MUCH for posting what you’ve learned!! This is still super-cool. And as a friend reminded me years ago, gardening is always an experiment anyway! …So with this knowledge under your belt, what are you thinking about planting in it next year? And/or will you cover it and overwinter the greens?? We hope to coax the kale and chard along as long as possible this winter. As far as next year: I had great luck with radishes in the top– maybe we’ll skip the tomatoes and do a bunch of root veggies up top instead. And the cucumbers really produced well considering everything, so we’ll definitely do that again. I’m curious to try all kinds of different things.